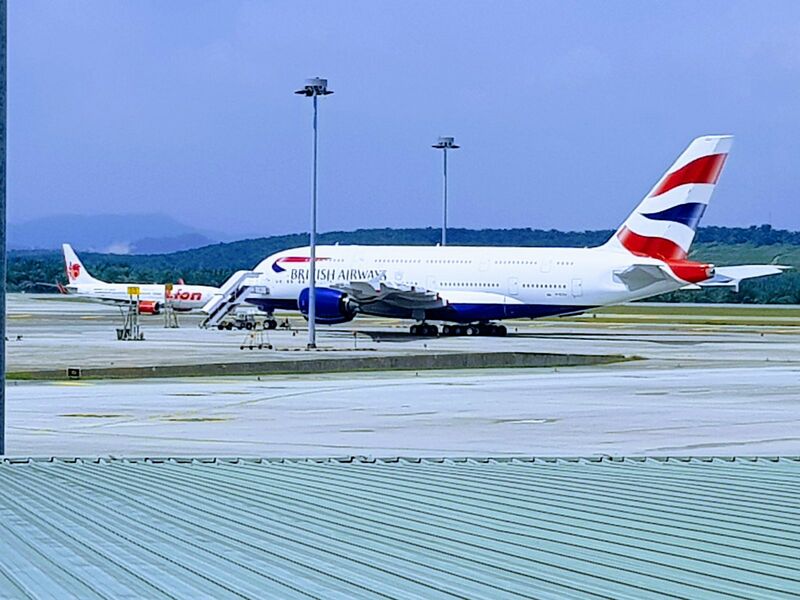 British Airways A380 In Kuala Lumpur? | Life, The Universe and ... Everything! British Airways A380 In Kuala Lumpur? Today (1 October 2017) I spotted a British Airways A380 here in Kuala Lumpur International Airport (KUL/WMKK). 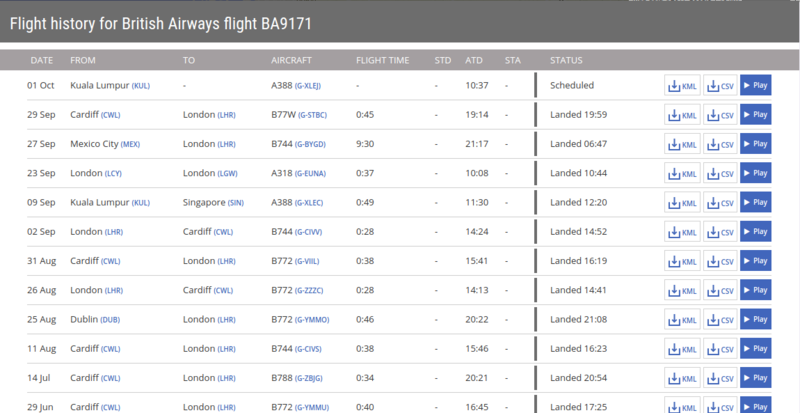 Which is interesting because British Airways services the KUL-LHR route using Boeing 787 Dreamliners. So what was a British Airways A380 doing here? Diverted? Lost? I checked the inbound BA34 and outbound BA33 flights to KUL for the day and they were still using a Dreamliner (G-ZBKN). So this A380 was not here taking passengers to or from London. Unfortunately the aircraft was parked on a remote parking bay and too far away for me to see the registration number (the photo above was very much zoomed in). Found her ... our aircraft is G-XLEJ! G-XLEJ flew LHR-SIN on 8 September as BA11. 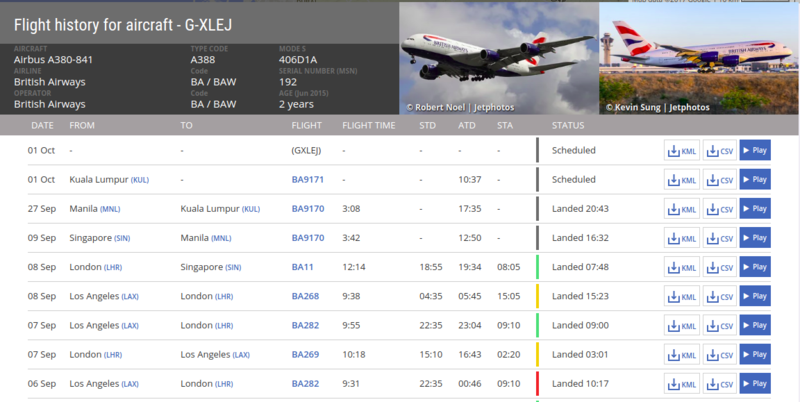 But it did not fly back to LHR as BA12 on 9 September (instead, that job was taken over by G-XLEC). Instead it flew on to Manila as BA9170 the next day ... and did not depart until 27 September, a whole 18 days later! Cardiff shows up quite often, and British Airways has a major maintenance facility there. So when a flight flies under this code, it's not a "real" passenger carrying flight, but rather just a flight number temporarily assigned for the flight to move under. "Lufthansa Technik Philippines (LTP), one of the largest providers of aircraft maintenance services in Asia, has opened a third hangar in Manila for work on widebody aircraft. With this step, the company is preparing for the technical support of the world's largest commercial aircraft. Lufthansa Technik Philippines, a joint venture between Lufthansa Technik (51%) and the Philippine MacroAsia Corporation (49%), invested USD 30 million in the construction of the new hangar, which is 8,500 square meters large and 35 meters in height. The new hangar offers space to work simultaneously on one widebody and two narrowbody aircraft. "With the new hangar, we will be able to keep up with the increasing demand for technical services for long-haul aircraft, particularly in the Asian market," said Lufthansa Technik Chairman of the Executive Board, August Wilhelm Henningsen. "By adding A380 capability, it underscores Lufthansa Technik Philippines' role as global aircraft overhaul center." "The continuous growth of the company leads to up to 400 new highly-technology and high-skills jobs in addition to the existing 2,700 jobs," explained Gerald Frielinghaus, President and CEO of LTP. Eleven years after its founding, Lufthansa Technik Philippines, located at Manila's Ninoy Aquino International Airport, offers comprehensive technical services including lease return checks and cabin modification for the Airbus A330/A340 and A320 families and now also for the Airbus A380. Lufthansa Technik Philippines (LTP), one of the largest providers of aircraft maintenance services in Asia, has opened a third hangar in Manila for work on widebody aircraft. With this step, the company is preparing for the technical support of the world's largest commercial aircraft. So ... mystery almost solved. G-XLEJ was probably taken out of regular passenger service and sent to Manila for a major maintenance check / overhaul. The only question remaining is why fly to Kuala Lumpur and not Singapore, since there is a regular A380 service for London-Singapore? Well normally, the flight outbound of London will also turn around and do the inbound journey as well, so there is no need to have two A380s there. Instead it has to be "slipped" into to the network, and probably has to wait for another A380 due for service in Manila, at which point they will swap the two aircraft. Yes, but still why Kuala Lumpur? Why not park the aircraft in Singapore, where it can be literally swapped with the next plane that needs to go for maintenance? I can only guess that parking fees for an A380 in Kuala Lumpur is a lot cheaper than in Singapore. After all we do know that the parking attendants are rather lax here ... 😎 Kuala Lumpur is an airport able to handle A380s that is also near enough to Singapore that its relatively painless to swap into a BA11/12 route.